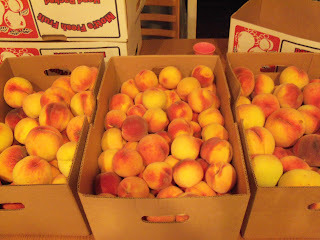 A Resourceful Home .com: Bulk Peaches & Canning! I have a friend who is part of a bulk-buying group. In August she contacted to me to find out if I wanted to buy any peaches. They had to be purchased in 25# boxes at a cost of $12 each. I could also buy #2 peaches (which means slightly off color or off size) for only $8 for a 25# box. Always thinking I can do more than I actually can - I foolishly asked for 75 pounds. Yes, 8 months pregnant and me saying "Sure, I can take 75 pounds - I'll just can them!" Yeah, canning a bazillion peaches when I've never done it before = Fun for Katie. I got directions from www.pickyourown.org, a great site I've used in the past, and I started in one night after the kids went to bed. Three hours, about 30 pounds, and very swollen ankles later I had only 10 quart jars done. Yeah. This is a photo of the blanching stage. Blanching makes the peaches' skins basically just fall off, then I sliced them up. A couple nights later I was at my bulk buying friend's house to babysit her kids and I saw that she had made several peach pie fillings that were just in her freezer in Ziplocs. She also had dried lots of her peaches. Note to self: Get a Food Dehydrator! And make some peach pie filling! 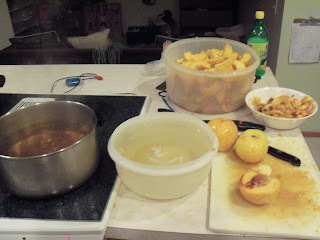 The next day I blanched another load of peaches with the help of DD#1 and then I sat at the kitchen table and prepared 7 Ziploc bags of peach pie filling. Won't it be nice to easily make peach pie every couple of months this year? I am looking forward to peach pie in winter! The best part was I got to do most of the work off my feet and DD#1 loved to help peel the peaches and scoop the other pie ingredients into the Ziploc bags. I finally had to finish canning the last 20ish pounds or risk losing the peaches so one night - again - I did 8 more jars and tossed in a couple jars of green beans, too, since I had the pressure cooker out. 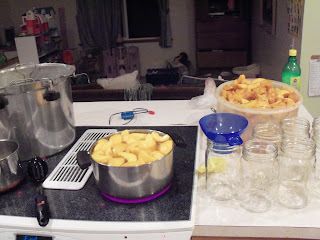 I ended up canning 18 quarts of peaches, making 7 pie fillings for 9" pies, and eating & giving away about 2 dozen peaches over a 10 day period. We all love peaches, so it was a treat to just eat as many as we wanted! A Resourceful Tip - Strong Perfume? Top Foods $5/$25 coupon on Sunday Times!